Saffron (Saffy) Quinlan, 16, is currently studying at Glossopdale Community College for GCSEs and juggles her studies with coaching Loud and Proud Cheerleading at BACE (Bounce and Cheer Education) and the spin off satellite club at Glossopdale School. Saffy got into cheer leading when she was 7 years of age and her dad took her to a half term holiday session with Loud and Proud at Philip Howard. She loved cheer from the outset and joined the club from there. She was first part of the 'cheer for fun' sessions and after showing potential was asked to join the youth team. She has competed since that time all over the country and most recently (July 2017) was part of the Loud and Proud Senior Elite National Championship winning team at Legacy National Championships at the NEC in Birmingham. The team beat nine other teams to win the title. Saffy was identified through the High Peak SSP 'Aspire 2B leadership Academy' to obtain UKCC level one qualifications. From this, Saffy, with the help of assistants Abbie and Emily formalised the informal training they had been working on to develop a regular after school satellite club, with the support of Mrs Nevin, the dance teacher from school. 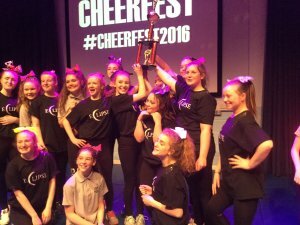 The girls then, through support from 'This girl Can Coach' funding, gained Legacy level two qualification enabling them to teach the 'Legacy' pathway of Cheer with more Acrobatics. The laid back, fun, friendly and welcoming approach of the coaches has been crucial for the popularity of the club, with music blasting, participant ideas collected together and mentoring support from the International level coach Hannah Jones at Hub club BACE. Saffy says of coaching; "I like to get better myself and see other girls get better too. I like to encourage those that don't normally get involved. I like to teach the sport I love and see others love it and know I played a part in that." Hannah Jones, Head Coach, BACE said; "We couldn't run the centre without our leaders. Saffy has worked hard to become a leading coach at Glossopdale and this has provided us with a person within school to spread the word of Cheer and the facility that is on their doorstep. We feel it is really important to equip the girls coming through the club with life skills that help to keep the club running, but in itself give them a sense of ownership of the club. This generates the feeling of togetherness that keeps these girls engaged." Do you fancy getting involved in coaching? To find out more about how you can get into coaching, you can check out our course finder and there's also the option to apply for a Coaching Derbyshire bursary. You can also sign up to Coaching Derbyshire to get e-newsletter updates and check out the Active Derbyshire volunteering pages.